Behold — the first good photo from last Saturday. This was taken sometime late in the night (1am? 1:30am? 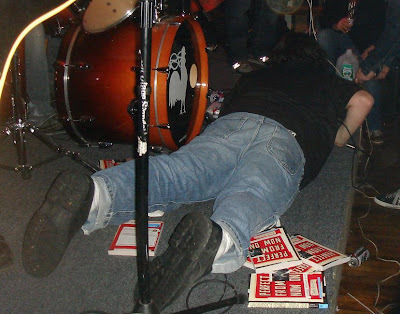 ), during the Textbook Committee set, with me either manning vocals on “Dayton, Ohio” or sharing vocals on “Smothered in Hugs” (you can see my New Balance shoes at the top of the shot) and the TBC’s “Blob Pollard” taking a nap on the stage. It pretty much sums up the night. Posted on March 6, 2008 by johnsellers	This entry was posted in Uncategorized. Bookmark the permalink.